Server instances were started using numactl binding 2 instances per chip using taskset. such that the 4 IRQs of a port are bound to different cores. Storage used for database files was shared for jms and server logs. Interrupts of each NIC were bound to separate cores of different procesors. 8 Oracle listeners were started, 2 were bound per processor using taskset. using the COMSTAR function, included in the FDA. 2x Sun Storage 2540 M2 arrays configured for the redo logs. Table M_WORKORDER, O_ORDERLINE and O_CUSTINVENTORY were horizontally partitioned. Table M_BOM, M_INVENTORY and M_PARTS were hash clustered. No modifications to the load programs were made. in the ord-orm.xml deployment descriptor. version column checking on entities against the database. 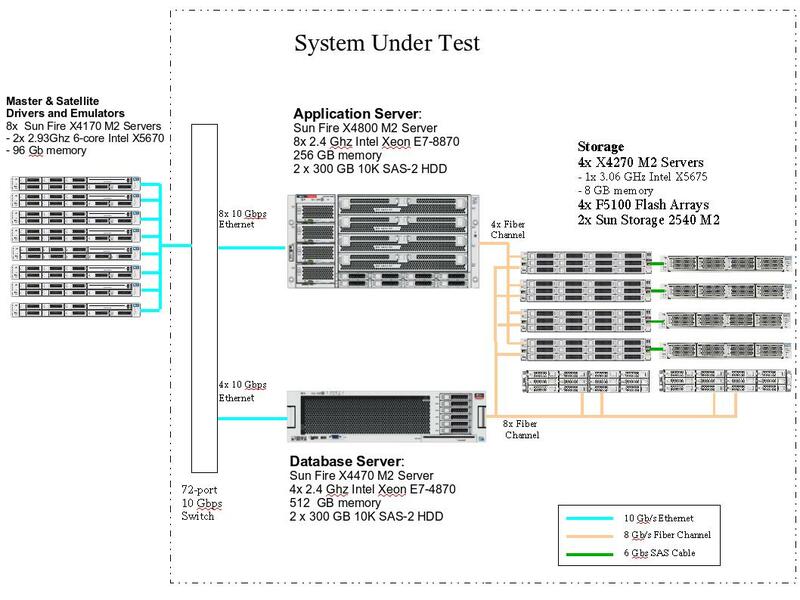 X4270 M2 Storage Servers and database redo logs on the Sun Storage 2540 M2 Arrays. configured as RAID 1 luns for the jms and server logs. This extrapolates to 1.2 TB storage for a 24 hour run. The database was configured with over 7 TB of mirrored storage. shall be determined by multiplying 'n' cores by a factor of 0.5. DNS round robin load balancing was used with the DNS server running on the Database Server. All network connections were 10 Gbps. normally generated by this benchmark.